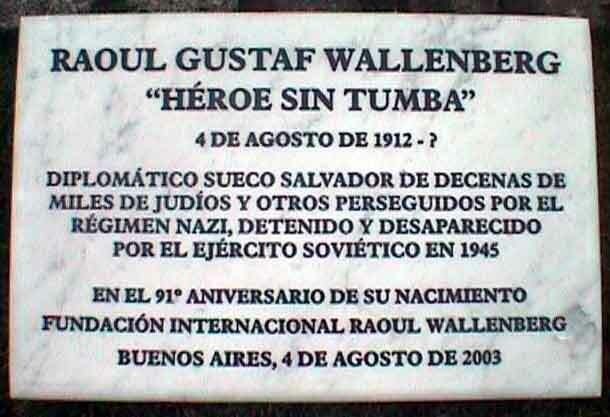 On Monday, August 4, 2003 the International Raoul Wallenberg Foundation, a non-government organization founded by Baruch Tenembaum, donated to the city of Buenos Aires, a commemorative plaque of the Swedish diplomat who disappeared during the Second World War. 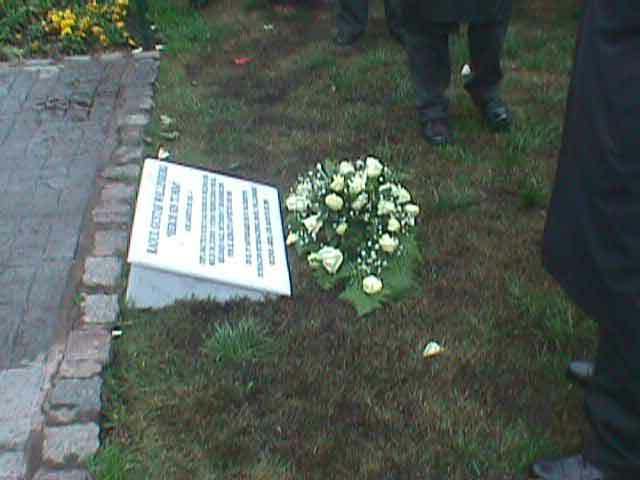 The plaque of marble has a commemorative legend on Raoul Wallenberg (1912 – ?) and on his rescue actions in favor of Jews and other persecuted by the Nazi regime. It was unveiled on the 91st birthday of the ”Hero without a grave”, next to the statue by the English sculptor Philip Jackson. In addition to the ceremony in the Argentine capital, the Wallenberg Foundation held on that same day similar commemorative ceremonies in New York, Tel Aviv, Montevideo and Santiago de Chile. 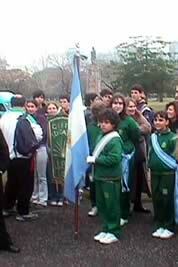 A sizable crowd, made of religious and community leaders, regular students of secondary schools, representatives of non-governmental organizations, diplomats, educational and government organizations attended the ceremony at the Ruben Dario Square. 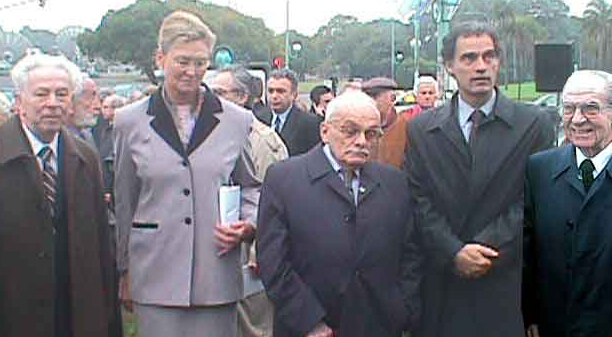 The Swedish Ambassador to Argentina, Madeleine Ströje-Wilkens; the Mayor of the City of Buenos Aires, Dr. Anibal Ibarra and the Vice-president of the Wallenberg Foundation, Dr. Natalio Wengrower presided the ceremony and delivered speeches. 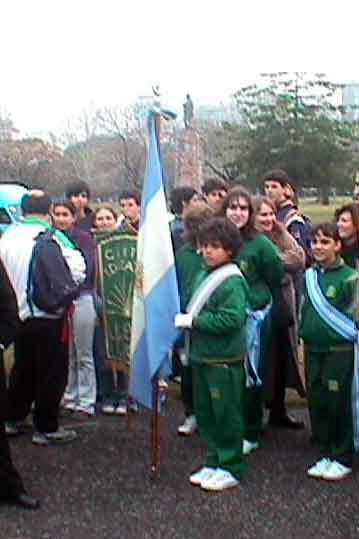 In the center stage the following personalities were present: Guillermo Olivieri, Secretary of Religion, in representation of the President of the Nation, Dr. Néstor Kirchner; Gabriela Alegre, Director of human rights of the city of Buenos Aires, Salomón Ben Hamú, Chief Rabbi of the Jewish-Argentine community; Monsignor Nicola Girasoli, of the Apostolic Nunciature; Priest Andrés Albertsen of the Danish Church; Rabbi Simón Moguilevsky, of the Libertad Temple; Oscar Vicente, Vice-president of the IRWF and the writer José Ignacio García Hamilton, also on behalf of the IRWF. 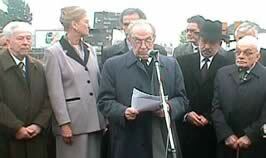 Letters of endorsement from different countries were read, specially the ones sent by US Congressman, Tom Lantos; The Israeli Minister of Justice Tommy Lapid and Raoul Wallenberg’s niece, Louise von Dardel. Laszlo Ladanyi, saved by Wallenberg in 1944 and his granddaughter Yael Beltchi, as well as Tomás Kertesz, also saved by the Swedish diplomat, and his grandson Diego Jedvabnik laid flowers next to the monument remembering Wallenberg. 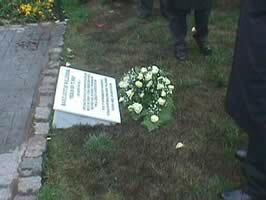 Undoubtedly, Wallenberg is one of the most important heroes of the Second World War. 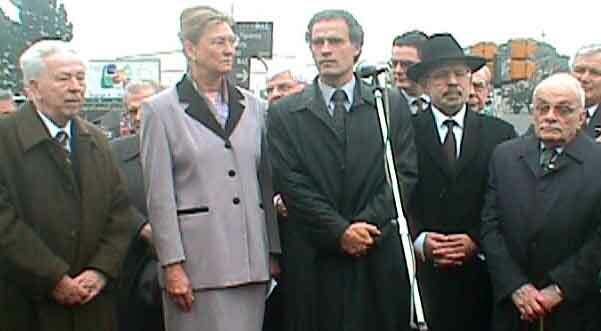 His rescue actions are a model of solidarity and civic courage beyond geographic or cultural borders. While bombs were raining over the city of Budapest, Hungary, the Swedish diplomat saved about 100,000 people from Nazi persecution. 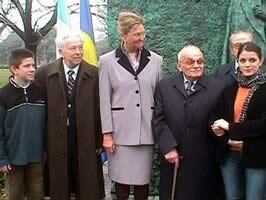 He was detained by the Soviet army in January 1945. 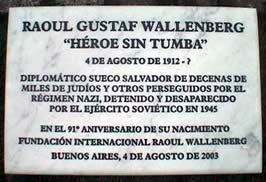 Raoul Wallenberg’s fate still remains a mystery.